One of my favorite cookbook writers Ina Garten, aka, the Barefoot Contessa. Her recipes and cookbooks are unpretentious and pretty simple. The sub-title of one of her cookbooks is "Easy ideas and recipes that make everyone feel like family." Spot-on. This is a lighter touch that the Gorgonzola Grilled Asparagus, and is best done in the oven, rather than the grill. With 4 simple spices that I actually always have in-house, it's no-stress veggies for dinner. Snap the rough bottoms of the aspagus stems off. Then slice them slightly on a diagonal to give them a good clean edge. This is really for aesthetic purposes, but it doesn't take too long. User a vegetable peeler to take remove some of the tougher skins on the bottom. The vegetable peeler is a very good trick and a good test to make sure your asparagus is fresh. Soggy stems will not hold up to the peeler. Pre heat oven to 400 degrees. 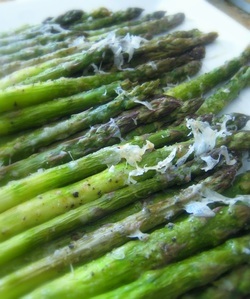 Lay asparagus flat on a pan, drizzle with olive oil and toss to coat. VERY LIGHTLY sprinkle with salt because you'll be adding parmesan to it. Sprinkle more liberally with pepper. Roast in the oven for 10 minutes. Take out and grate or sprinkle Parmesan cheese over. Return to the oven for 2-3 more minutes, depending on how quickly the cheese melts. Transfer to a serving platter, or eat off the pan. 1. The Contessa's original recipe directs a 20 minute roasting time. I like a little crunch to the asparagus so I reduced the time a bit, even with chunky-stemmed aspragus.